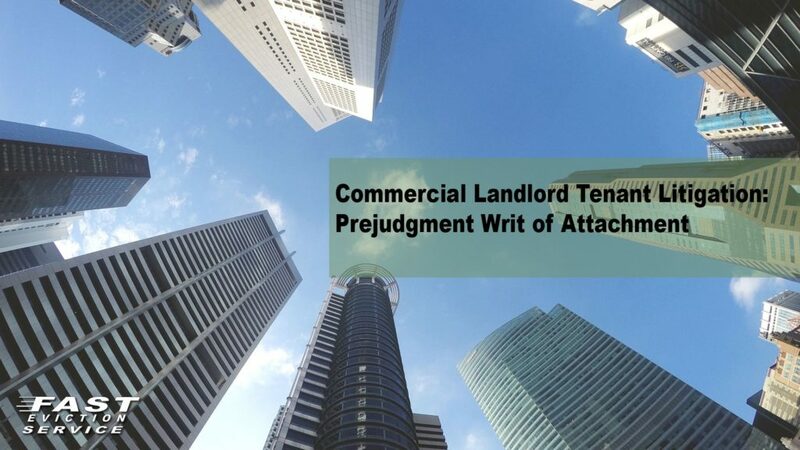 Commercial landlords find themselves involved in disputes against their tenants for a variety of reasons including non-payment of rent, non-payment of other fees or misuse of the rental property. When a commercial tenant has breached the rental agreement by terminating the rental agreement – such as vacating the property early leaving the landlord without the rental income pursuant to the terms of the agreement and requiring the landlord to expend large sums of money to make the rental property rentable to another tenant – an experienced law firm specializing in landlord tenant law can make a huge difference in the final outcome. In order to take action against a commercial tenant for breaching the commercial rental agreement after the tenant has vacated the property early the landlord must immediately mitigate the damages by getting the rental property ready for new commercial tenant by (1) taking possession of the rental property; (2) entering into the rental property taking pictures and/or a video of the rental property in the condition as it was left by the tenant; (3) taking an inventory of what property and equipment the commercial tenant has left behind and the damages to the rental property; (4) make a list of all of the repairs that are required to be made to the rental property and obtain repair estimates for those repairs; (5) within 21 days after the tenant has vacated the rental property prepare and mail to the tenant a Security Deposit Reconciliation that specifically deducts form the Security Deposit the rent owed to the end of the lease and the damages, other than normal wear and tear, caused by the tenant; (6) mail the Security Deposit Reconciliation to the Tenant; (7) market the Commercial Rental Property for rental; and (8) get the commercial rental property ready for the new tenant. Once all these steps have been completed the Commercial Landlord must determine if the former tenant has enough resources to pay a judgment that may be obtained against the tenant. Prior to taking any action against a former tenant who has vacated the rental property owing the landlord money, the Commercial Lease must be reviewed to determine if there is a mediation/arbitration clause for all non-eviction commercial cases. If such a clause exists, the landlord and/or the commercial landlord’s attorney must demand Mediation/Arbitration before filing a lawsuit to secure any claim for attorney fees and to ensure that the case is not kicked out of court for failing to follow the right procedures. A competent Landlord Attorney can assist the Commercial Landlord in deciding if a potential lawsuit exists against a former tenant, the value of that lawsuit and whether the tenant would have the financial wherewithal to make it worthwhile to sue the former commercial tenant who vacated prior to the lease termination date. Once the Commercial Landlord decides to file a lawsuit and/or to commence arbitration/mediation against the former tenant a decision will need to be made on whether to seek a Prejudgment Writ of Attachment against what ever assets has been located for the vacating commercial tenant. A strong pre-rental application obtaining as much information from the prospective tenant will always assist in this process. In general, Pre-judgment attachment is a prejudgment remedy limited to cases arising out of commercial transactions and prohibited in consumer transactions. The procedure requires a court to make a preliminary determination of the merits of a dispute involving a creditor and a debtor. Attachment is governed by Attachment Law (CCP §§ 481.010–493.060). The statutes are strictly construed and must be followed with care to avoid being accused of wrongful attachment. Attachment can be a very powerful litigation procedure particularly where the case is strong and there is a real risk that the opposing party may attempt to transfer or conceal assets. Precisely because it is a very powerful litigation procedure, the attachment statutes provide a relatively complex procedure to conform to Constitutional Due Process requirements. Attachment can be an expensive procedure to undertake without some confidence that it is necessary and appropriate. In addition to legal expense, there is a bond requirement that will require the payment of a bond premium and can create a difficult hurdle since the surety may require that the indemnity agreement protecting the surety be collateralized. There also are risks associated with potential liability for abuse of process or malicious prosecution arising from a wrongful attachment.